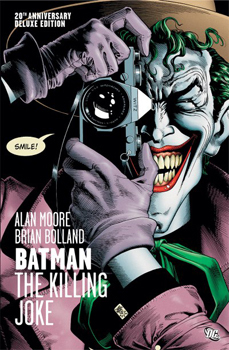 I feel slightly guilty posting The Killing Joke as a BookBin entry, considering the fact that it’s just a single issue comic book…nothing long like some of Alan Moore’s other works that have found their way to the lair, like Watchmen or V for Vendetta. Then again, I did say at the end of my post about V for Vendetta that I wanted to read this one next. So, there you go. This time around, though, I’m going to have to say that the main draw of this story wasn’t Moore’s writing. Instead, it is the hands-down amazing artwork of Brian Bolland. Right from the very first panel of this comic book, I was in love with Bolland’s dark artistic stylings. He offers clean lines, gorgeous details, and a wicked sense of how to make even the mundane sinister. If you are a fan of graphic media, you need to witness Bolland’s visual take on the great batty god of DC Comics and his vile, vituperative, villainous foe, the Joker. One word of caution: Apparently, the recently released 20th anniversary edition of this comic is the one you should seek out, rather than the original 1988 release. From what I’ve read, that release has some funky coloring that Bolland corrected for the anniversary edition. I’ve read some complaints about the color change from comic book purists who preferred the original, old school colors, but I have to say, the coloring in the anniversary edition is beautiful and very complementary to the artwork and the story. As for the story itself…meh. Maybe I had that reaction because I read the book while extremely tired, but I didn’t really feel any sort of wow factor from this possible origin story for the Joker. I liked the dark undercurrent of the story, always roiling right at the surface. I also liked this dark take on the Joker. As someone who grew up thinking of this character as only the buffoonish Cesar Romero portrayal from the awesome Adam West show, I liked seeing this character in a far more successfully sinister light (I say successfully here because I really didn’t think the Heath Ledger portrayal of Joker as psychotic villain was successful at all…sorry). But there was something…I don’t know. Something missing? Something off? Maybe it was the Barbara Gordon portion of the plot that really turned me off to the story. Definitely gave me an unhappy WTF feeling, that’s for sure. But this has been my complaint about all of the Moore-written graphic novels that I’ve read so far; there’s something that always rubs me the wrong way and leaves me feeling…meh. Again, though, this Joker is just awesomely cracked, and I believe that’s primarily thanks to how Bolland depicts him throughout the book. Final Verdict: I don’t know that I would want this book for the story itself, but Bolland’s line work made up for the places where the story let me down. I’m not going to rush out and buy The Killing Joke (although I have already added it to my wish list), but I think that at some point it will probably become a part of my collection. So, yeah, it’s a keeper. Perhaps next I’ll try to find Frank Miller’s The Dark Knight Returns…that should keep me busy until the July 6 release of Batwoman: Elegy.